To understand the schwa, it’s important to remember that English is a “stress-timed” language. We don’t allow equal time for every syllable, but give much more importance to the stressed syllables that carry the majority of the meaning. When we speak quickly, we barely take time to pronounce the “unimportant” syllables, and slide into an easy neutral vowel sound. There’s a better, more complete explanation here. In ”Language Corruption is a two-way street,” Ben Yagoda discusses the ongoing exchange of words and expressions between the U.S. and the U.K. He argues that British complaints about unwanted “Americanisms” now being used in England are only half the story. 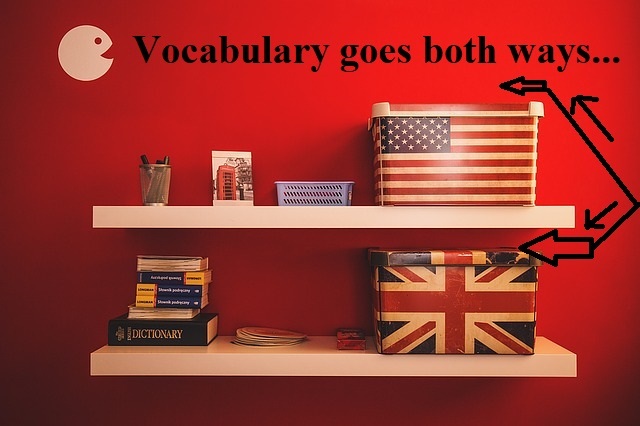 He gives examples of many Britishisms Americans have recently adopted. The process may be as old as the connection between the two countries, but it has speeded up with the Internet and international news services. It appears clear that even language purists who don’t want any new terms from across the Atlantic can’t put up a wall high enough to keep them out! If you really need something more to do, after Sept. 6 or so you could check out the Overview video—part of the free intro to my Vowel Sounds course. Slide 6 gives some examples of words with a schwa. I hope to have that video up by Sept. 6 or before, and the rest of the course uploaded within a week or so. If you do look at it, I would love feedback about it: was it clear enough? Did it leave out information that would be important for someone learning English to know? How could I improve it? I’m still just learning how to present courses online (& barely have started learning video recording!) but I hope I can make it understandable. If you have feedback or suggestions, you can just reply to this newsletter.